One of the things I’ve always loved about the short film format is the freedom it allows to experiment with both craft and story. And one of the best out there for inventive, boundary-pushing filmmaking has to be NYC based Director Paul Trillo, who has really made a name for himself in the online film community with his inventive production. From PoV shot shorts about the life of an iPhone to back-hugging camera mounts that put you in the headspace of its wearer, Trillo is certainly using his eclectic output to test the limits of filmmaking. 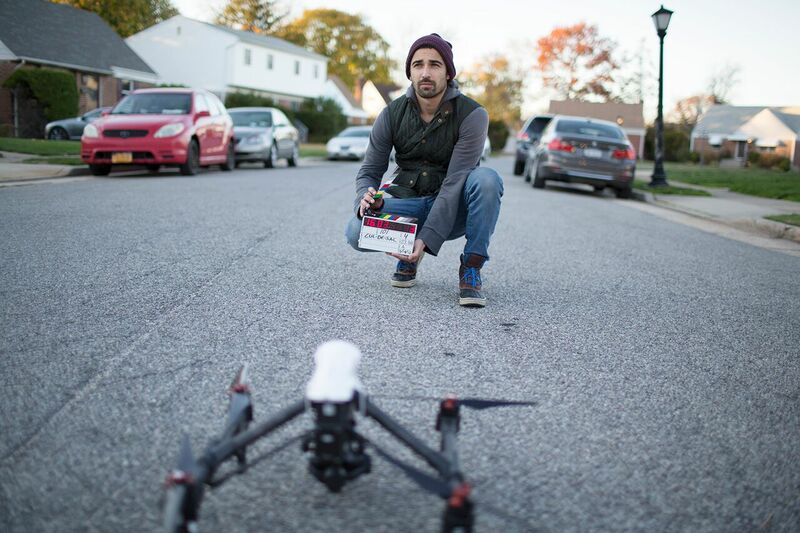 Joining us today to discuss his latest short At The End Of The Cul-de-Sac, which features a near 10-minute uninterrupted drone shot, Trillo reveals the high and lows of working with this new technology. When creating your film what came first; the idea to shoot a film entirely on a drone or the story for At the End of the Cul-de-Sac? The process of writing this was unlike anything I’ve done before. A lot of the time, my stories come from a feeling, a visual, a random ‘what if’ question that pops into my head. What initially got me excited about this was the idea of pushing technology in service of story. Could drones be used for storytelling purposes? From there it evolved from a collection of restraints and freedoms that ultimately added up to the story we shot: A single take, shot from a drone, in a closed off location. So I started looking at the film in that structure, something that would play out in real time. Something that would be tense to watch if the camera never cut. It felt theatrical in a sense, so I was hoping to create something that felt like a one act play. There were also a few seeds from reality that feed into this. The opening of the short was taken from something I had experienced in Amsterdam. I was walking through a quiet suburb outside of the city, literally only a couple people on the street. When all of a sudden this car comes screeching in; swerving all over the road. The car drove up the sidewalk and a guy jumped out. He immediately started banging on an apartment door, screaming at the window. I didn’t know what the hell he was saying but it was obviously fascinating and I knew it would be a great opening for a film. I’ve seen drone shot shorts before, but the story always seems like such an obvious pick, what was it about this story that made you want to translate it to screen as one continuous take from a drone? Around the same time as developing this single take idea, I had been thinking a lot about the culture of public shaming that has run rampant on the internet. Eventually these ideas blended with my interest in pulling off this stunt. I wanted to find a story that was completely unexpected for something that had such a big gimmick built into it. I wanted to throw surprises in there that would throw off people’s expectations of what a drone film should be. I think the obvious route to go would have been to do something action oriented. I wanted to explore what other types of stories this could be used for. I knew having this floating, continuous camera move, would imbue the camera with a subjective sense of character. It does not exist within our regular language of film. I wanted to be aware of that and use that idea to the advantage of the story. The camera is an active observer of this scene. That’s where this sense of morality came in. Using this to display public shaming seemed to be an interesting fit. For people who are familiar with your work, ambitious, inventive production is something you’ve become somewhat synonymous with, but what challenges did you face with this production? Well, I surely had never done a long take this long. Nor had I ever done ADR to this extent. Two things that made me uncomfortable. But as you noted with my work, I like to play around with different modes of production. When something makes me uncomfortable, I know it’s something I must do. Since I hadn’t seen drones used so specifically for storytelling, I wanted to figure that out. I wanted to see if it was possible to use a drone in a way other than to capture a cheap helicopter shot. I personally love things with intense, careful choreography (I mean who doesn’t?) and even though it wasn’t something I was accustom to, it was something I wanted to add to my toolbelt. I was doubting myself the whole time that it could actually be pulled off. And the way the whole thing came together, we just barely pulled it off. Rehearsals and timings feel hugely important in these ‘one-take’ shorts, but I’m assuming this was even more so in your production, just how essential was perfect planning in the success of your short? That’s right. 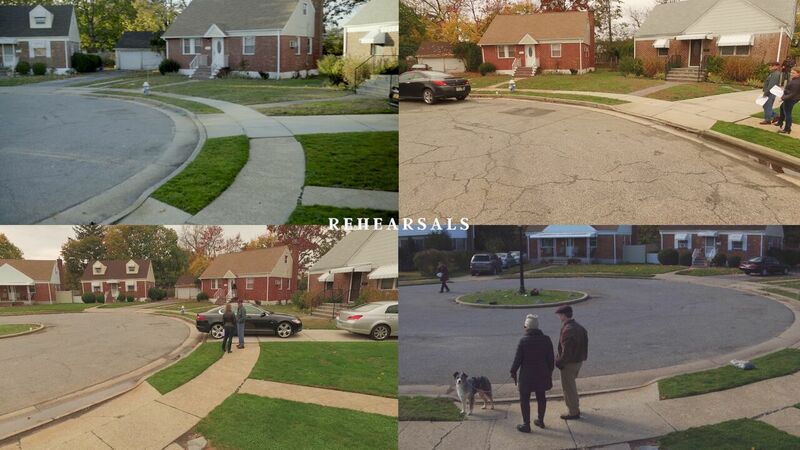 I believe anyone is capable of pulling off a long one take, they just have to be committed to the amount of rehearsals and detailed planning that comes with it. There are never too many rehearsals you could run on something like this. Since there was a certain level of danger to this, things had to be incredibly precise. The consequences of missing a beat here as opposed to a steadicam shot could actually get people hurt so the entire piece was first created as an animatic in Cinema4D. It was a beat-by-beat breakdown of the script. 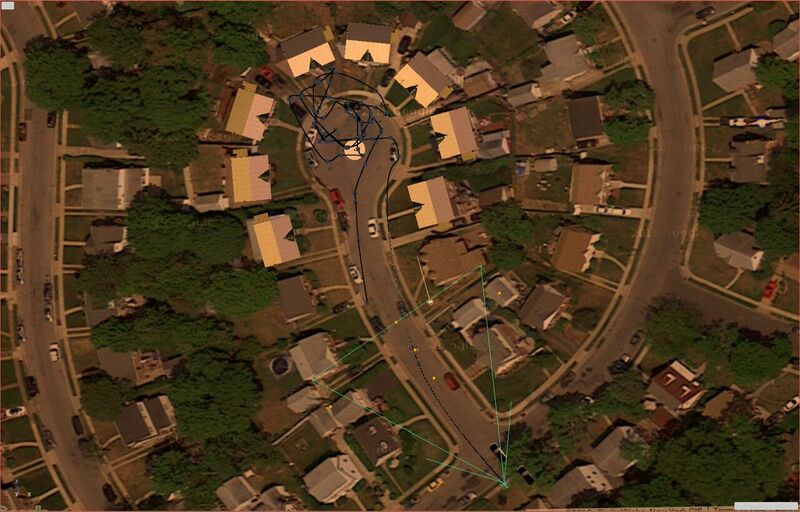 3D models were placed on a Google earth map and computer-generated voices were used to figure out the timing of the dialogue. Then it was three days of careful step-by-step recreation of that animation. Both the actors and the pilot had to have it memorized while keeping things feeling somewhat natural. The AD, Jake Wasserman, had to break down that animation into tangible cues and plant walkie-talkies throughout the scene so that when one domino piece fell into place he was ready to call out the next domino piece. Everyone had to be incredibly present and I’m impressed by everyone’s dedication to executing my vision. 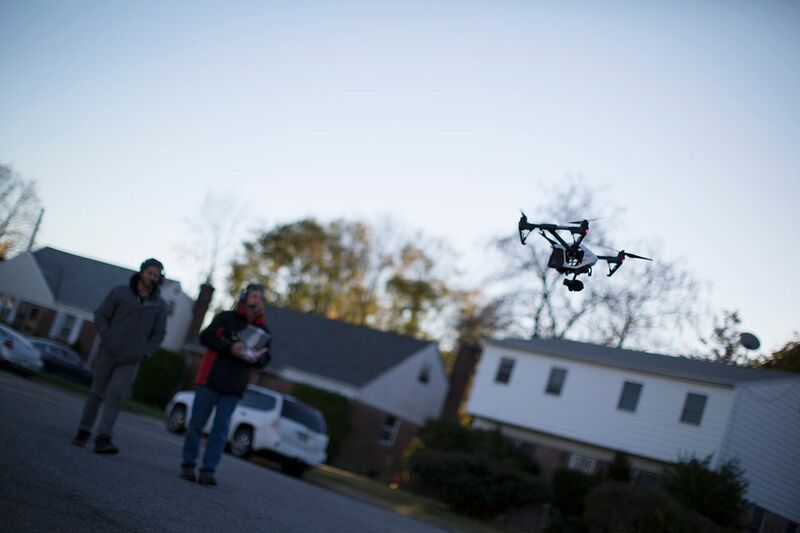 How was the process of working with your actors different when shooting on a drone? As I was mentioning, the actors had to not only be precise with their blocking and timing, more than usual but also perform in a way that feels natural while a large buzzing lawn mower flies around your head. None of the actors had experience with drones, I’m not sure many actors at all have experience performing dialogue with the drone so close to their face. The actors needed to hear themselves without shouting. I imagine even trying to hear your own thoughts over the loud buzzing sound was difficult. However, everyone was very excited to jump on board and do something they hadn’t done before. There were definitely a lot of question marks for them. It didn’t really make sense until they saw the animation I had created. I need to assure them that this crazy stunt would actually work when in the back of my mind I wasn’t sure myself. I had to keep them at ease and mitigate the amount of risk that was involved. We made sure we kept the drone a safe distance from everyone and that there would be certain calls if something went wrong. Thankfully there were no close calls. Beyond the challenges of the drone, there are the challenges of shooting a long take. No actor wants to be the one that messes up and flubs a line or misses a step when you’re 6 minutes into the shot. So the stakes are pretty high for them as an actor. Working out the technical challenges of another drone piece at the moment. It may be pretty far off from execution but I’m incredibly excited to push the technology further. In between various commercial and music video projects, I’m pushing to get a feature made hopefully in the near future.